Recent revelations about a botched police response to a 2014 domestic dispute that preceded a Hyde Park woman’s slaying has turned the spotlight on police officers who have amassed a substantial number of citizen complaints against them. The officer involved in that case, who failed to arrest the man later accused of murder, had nearly two dozen complaints filed against him over the course of a 28-year career. The disciplinary process in the Hyde Park case has taken more than six months. But a Globe review of Boston police records reveals that the officer’s record and the time it has taken to mete out punishment are not an anomaly. One dozen officers have faced 20 or more complaints over the past 20 years; internal affairs investigations can languish for years. The officers with the most complaints work in the department’s homicide unit, and in stations downtown, in South Boston, Roxbury, Dorchester, and Jamaica Plain, and have been the subject of complaints regarding untruthfulness, use of force, disrespectful treatment, unbecoming conduct, and criminal violations. Lawrence D. Welch, a 26-year veteran of the force, has accumulated 55 complaints, 31 of which were at least partially substantiated. In an incident similar to the recent Hyde Park case, Welch was suspended for three days after failing to document a domestic violence incident in 2001 involving a Boston police officer. Welch, who now works in District C11 in Dorchester, did not return calls seeking comment. Sergeant Martin B. Kraft, who worked for the department for 32 years before retiring last year with charges pending, amassed 40 complaints with 15 upheld. In an interview last week, Kraft said he received a lot of complaints because he made “the most arrests of any sergeant in the police department” at that time. Kraft retired after coming under fire for accepting a job as the security chief at a marijuana shop in Roxbury. An attorney who represents officers in legal matters said a high number of complaints does not necessarily mean an officer is bad at his or her job. “There are some officers who are very active and by virtue of that they’re going to get more complaints,” said Kenneth H. Anderson, a Boston lawyer who represents police officers. “Some officers work in areas where they’re going to generate more complaints than others,” said Jack McDevitt, director of Northeastern University’s Institute on Race and Justice, noting that most officers have few or no complaints at all. Complaints filed by residents can serve as an early warning system. Overall, complaints against Boston police officers were down last year, to 386, compared with 527 in 2013. 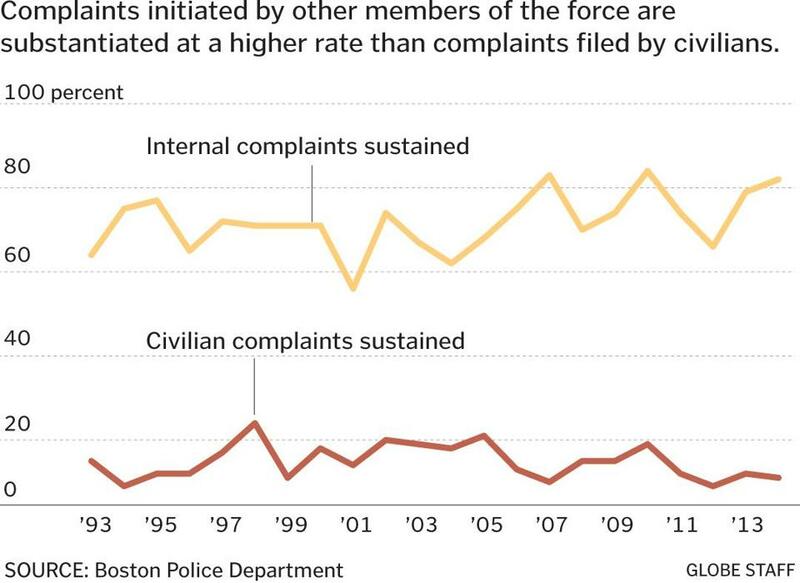 Use-of-force complaints are at a more-than-two-decade low. Now, most complaints allege disrespectful treatment. The decline in use-of-force complaints means the department is moving in the right direction, policing experts say, but the disrespectful treatment allegations should be cause for concern. “If we have interactions with the police that continue to build on the perception that people already have, it continues to erode the community’s trust and the community’s confidence in the police,” said Ivan Espinoza-Madrigal, executive director of the Lawyers Committee for Civil Rights and Economic Justice. Complaints against police officers can be filed by any civilian or by a fellow member of the police department. For example, in the November 2014 Hyde Park domestic dispute case, the complaint against Officer Robert Boyle and Officer William Hubbard was initiated in April by a lieutenant detective who learned the pair had shirked their duty. The officers had failed to check a computerized system to verify the restraining order Stephanie McMahon had against Randall Tremblay, whom she wanted ejected from her home. McMahon was killed the next day, allegedly by Tremblay. Some civic leaders say they are troubled by years-long delays in resolving even the simplest concerns. A 2005 accusation that an officer was negligent was investigated and upheld in just four days. But three years passed before the officer was disciplined — simply because the case file lacked the proper signatures. A report this year by the city’s civilian oversight panel found that while most complaints were resolved in fewer than two years, “significant delays persist” — 30 percent of cases it reviewed took more than two years to be resolved. “We need results in a year; after that, who cares?” said Jorge Martinez, executive director of Project RIGHT, a Grove Hall antiviolence organization. A review of 45 complaint files shows the problems caused or exacerbated by a protracted process: Civilians get frustrated and stop cooperating. Officers sometimes do not recall certain incidents after several years or become difficult to reach. In other cases, complainants fail to present the evidence necessary to support their claim, contributing to a delay. Police Superintendent Frank Mancini, commander of the Bureau of Professional Standards, which includes the Internal Affairs Division, said internal affairs investigations are also affected by civil lawsuits or criminal prosecutions. In those instances, his investigations take a backseat. Mancini said he does not believe a timeframe should be set for resolving complaints, such as in New Orleans, where complaints must be resolved within 90 days. Mancini said his unit is currently identifying complaints that could be eligible for mediation. The remainder, such as those involving misconduct, will continue to be investigated by the Internal Affairs Division, and those involving serious criminal allegations will be reviewed by the city’s Anti-Corruption Unit. Boyle and Hubbard — the officers who allegedly mishandled the Hyde Park domestic violence case in 2014 — will have a disciplinary hearing, and Evans, the commissioner, will decide whether the officers should be suspended. Evans said meting out discipline can be a difficult task. In one ongoing case, officer David C. Williams was twice terminated for using excessive force and was reinstated both times. He was last fired in 2012 after using an improper chokehold to arrest former Middlesex County correction officer Michael P. O’Brien, who was awarded $1.4 million in a settlement. The city is fighting Williams’s reinstatement. But, in the last 10 years, the Civil Service Commission has sided with the police department in 29 cases, affirming the commissioner’s disciplinary action. The commission ruled to overturn the department’s decision in 13 cases, according to records provided by the commission. 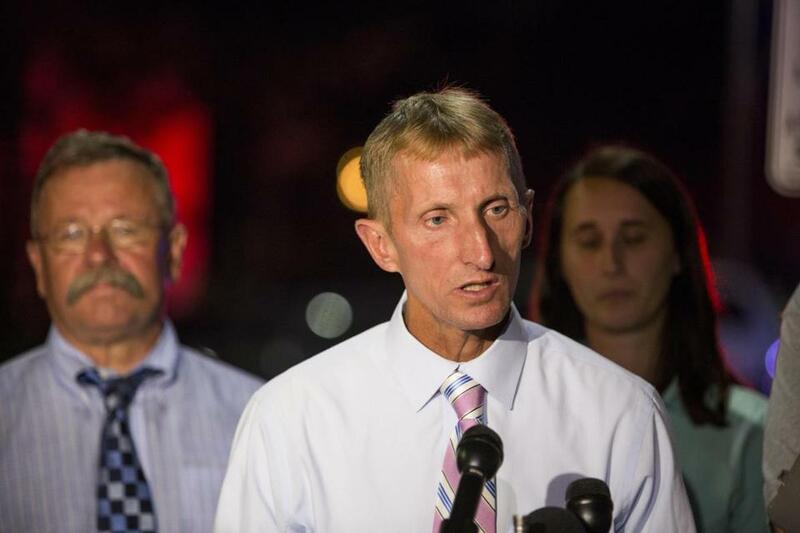 Boston Police Patrolmen’s Association Union president Patrick Rose said officers who feel they have been wrongly accused deserve due process. Todd Wallack of the Globe staff contributed to this report. Jan Ransom can be reached at jan.ransom@globe.com. Follow her on Twitter @Jan_Ransom.